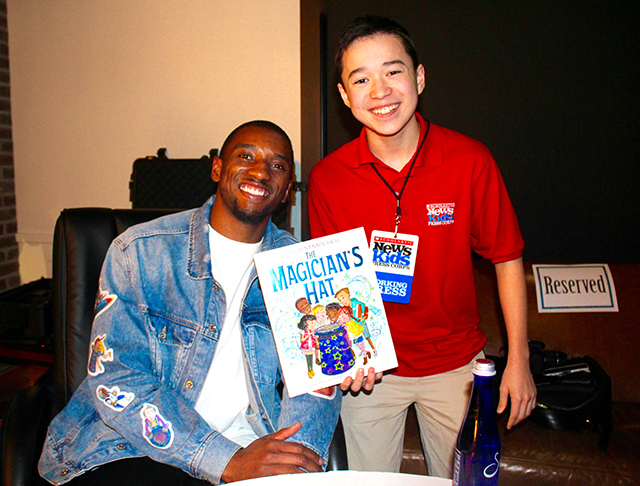 Reading Is Magical | Kid Reporters' Notebook | Scholastic Inc.
On February 25, Mitchell launched his debut picture book, The Magician’s Hat (Scholastic), at An Unlikely Story in Plainville, Massachusetts. He read aloud—something that was very hard for him to do as a kid. This time, he had an audience of hundreds of children and adults. In addition to writing a book, Mitchell earned a Super Bowl ring with the Patriots in 2016. But he still remembers his struggles as a kid. When he was in the second grade and attended his school’s book fair, he didn’t have the money to buy the book he wanted, Captain Underpants by Dav Pilkey. Now, years later, Pilkey and another one of Mitchell’s literary heroes—Jeff Kinney, creator of the Diary of a Wimpy Kid series—have endorsed The Magician’s Hat. The book mirrors Mitchell’s own experiences with reading. It tells the story of a magician who invites kids to reach into his magic hat and see what they discover. Each child pulls out a special book that helps his or her dreams come true.